It was a long time coming and a whole lot of thinking time too but Episode 1, Part 4 of Bat Storm: Financial Crisis is finally here. This is the exciting conclusion. Of course, if you haven't seen Episode 1, Part 1, Part 2 or Part 3, clicking those links will take you to their respective blog posts where you'll find that episode. 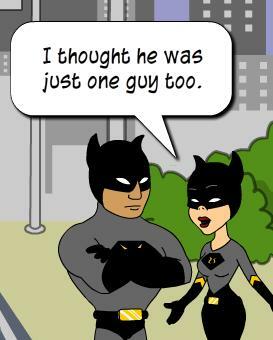 In this final part, Bat Storm and Bat Flash follow the clues and close in on their man. With the reward money for the safe return of the missing girls back in their sights it seems financial prosperity will soon be theirs... or will it? Part of the reason it took so long for me to make this fourth installment was finding a 'family friendly' motivation for James (a.k.a. the Jokester's employee Jokester). I didn't want this episode to go down that dark path where the two girls got hurt in any way so I came up with this idea that the Jokester i.e. James had, at some point, met each girl and convinced them to go on a 'fun adventure holiday'. Knowing how precious parents can be with their kids James anticipates a reward will be offered which he will then collect when he shows up with the girls at the police station in his regular street clothes. Hence all the time the girls have been missing they've been having a lot of fun in order to stay co-operative. Don't analyse James' plan too closely. I know it's riddled with plot holes and not thought through particularly well. I'll put it down to James not being a master criminal. I mean, he panics when he sees Bat Storm instead of holding his ground and feeding Bat Storm the story he was going to tell the Police. The other difficulty I had was laying down a trail of clues for Bat Storm to follow in order to find James. In the end they get lucky but at least it's 'believable lucky' as they were already in James' neighborhood. Back in my post on part 2 I eluded to some proof that I made up this script as I went along. If you look at the Jokester in the hospital scenes in Part 4. Take a close look at his face - and compare it with the Jokester in the hospital in part 2 you'll see that in part 2, it is actually the real Jokester at the hospital and not the James Jokester. Back in Part 2 I had no idea of the events in part 3 and especially not in part 4. If I had the Jokester at the hospital in part 2 would have been the James Jokester. I didn't make the James Jokester until I started work on Part 4. Again there's not too much custom flash work in this apart from James' mini van, which I also used in Pimp My Ride, and a new version of the bat grappling hook so Bat Storm could spin it around and then throw it. I'm surprised no one so far has picked me up and wondered how Bat Storm suddenly is holding a grappling hook? I'm hoping most people just assume he pulled it out of his utility belt - as Batman would. Over all I like how this part came together. With so many characters it could easily turned into a confusing mess but everyone's story seems to wrap up nicely. I particularly like how I was able to bring Super Charge and Charge Girl back into the action in a way that made sense - due to having already established that Super Charge is not only watching Bat Storm's movements but actively interfering in his ability to fight crime. Although I haven't really met my original goal of writing a long episode quickly (the whole episode was meant to conclude in January!) I do think I've shown I can write a good, funny story for a sitcom length cartoon. However, I don't think I'll really have proven this until I have a few more episodes complete. I had a great time making this and I do intend to write a second episode. After all, I bet you're itching to find out if Bat Storm buys that truck!